The first rule is: Forget everything you thought you knew about boating. Upon embarking on our four-day journey on the Trent Severn Waterway (TSW), my husband and I quickly realized that we needed to erase the hard-earned lessons we had learned over the years about being shipshape boaters. The only kind of boat easily charter-able on the TSW is a houseboat. Brought up through the ranks of junior sailing (my husband was an Annapolis Yacht Club kid, me a Severn Sailing squack) we had always been taught to appreciate boat-handling finesse. Well, painfully, this is the first lesson left behind. When one is trying to drive a 36-foot (or larger) pontoon houseboat which is propelled with an outdrive mounted to the stern, one is satisfied with making it to a dock or lock with the bow still pointing in the direction one is going. Yes, it is very easy to get sideways in these less than graceful crafts. Fenders/bumpers are a must and are continuously deployed. Appreciating the cushion these necessary accoutrements provided made me rue every snide comment I ever levelled at a Bay boater trailing bumpers. Bay cruising requires certain deprivations. Not so houseboat travel on a pristine lake. Conserve water? No need. Shower and do dishes with limitless hot water? Go ahead. Swill wine out of glass glasses? Who wouldn’t? Grill a feast? Please do so on the full-sized grill screwed (screwed!) onto the front deck. Beach her on rocks? Doesn’t everyone? While these craft are not particularly sleek or graceful, their utilitarian nature provides an excellent platform for an enjoyable boating vacation. So, how did we Chesapeake Bay sailors end up in Ontario for a big chunk of our vacation? After attending one of the winter lectures at Fawcett Boat Supply in Annapolis, my husband and I became enchanted with the idea of boating on the Trent Severn Waterway. 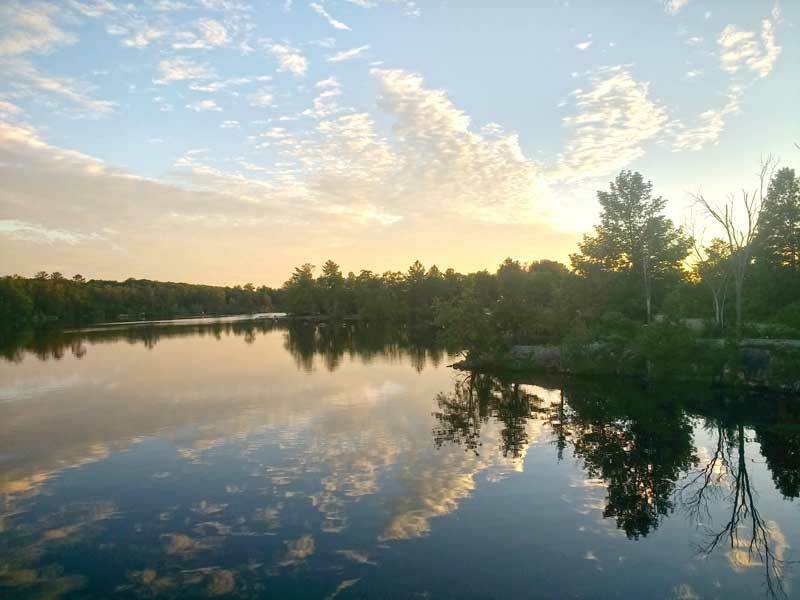 The Trent Severn is a series of lakes connected by locks and frequented by vacationing Canadians and Loopers. Begun in the early 19th and finished in the 20th century, the TSW at its inception exemplified what we in the U.S. refer to as the Canal Craze. Shortly after steam power was applied to ships and it became possible to travel against current, tide, and wind, folks in the U.S. and Canada became obsessed with constructing canals to facilitate inter-regional trade and travel. The emergence of this type of trade corresponds to early industrialization, and these canals fed burgeoning economies in the U.S. and Canada. Today, the TSW is a haven not for commercial ventures but for pleasure boaters. It connects Lake Ontario to Georgian Bay and is one of the ways that those seeking to do the Great Loop can navigate between the Great Lakes and the Mississippi River. While we hope to someday join the ranks of the Loopers, we contented ourselves with doing a part of this great journey during our summer vacation. A real pleasure of this trip was experiencing Ontario and its people. 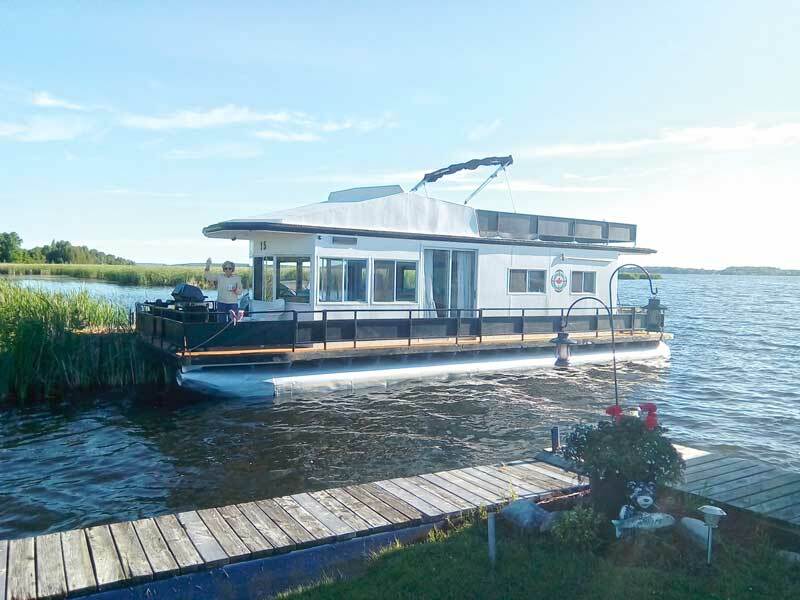 The only kind of boat that is easily charter-able on the Trent Severn Waterway is a houseboat. There are three companies that offer a range of houseboats for vacationers. We were very pleased with our 36-foot Happy Days rental. It offered two small bedrooms, a fully stocked galley, and a commodious upper deck that one could descend using the ladder or slide. Another real pleasure is to experience Ontario and its people. Canada on the whole seems to be a very tidy place. Humble cottages and grand mansions are neatly kept, and most sport the attractive Canadian flag. Red, therefore is the predominant accent color for dock ensembles. More than once, I mistook an Adirondack chair for a distant channel marker. While house boating on the TSW does present some interesting challenges and stark differences from sailing on the Chesapeake, there are a few universal truths to both experiences. The comradery of the boating community remains constant. A friendly wave between passing craft is the universally accepted signal that one is a part of this community no matter where you are. And “messing about in boats” no matter the type or location is a singularly wonderful way to pass time. For more Cruising features, including a recent article on "surviving" overnights aboard with your family, click here.